Sundance Landscaping Limited is an award winning landscape design and construction firm. Sundance specializes in high end, residential landscape architecture and construction. Leading Calgary Landscape Contractor & Designer Best of Houzz 15-17! Aura Landscapers is a small, family-run Calgary landscaping & design business started by James Knaut in 1981. We pride ourselves on communication, efficiency and outstanding customer service. With over a decade of experience, we have mastered our technique and incorporate the best installation methods to give you, our customer, the best and longest lasting result. At Oasis Landscaping we believe that everyone should have a beautiful, usable outdoor living space. With over a decade of experience, we have mastered our technique and incorporate the best installation methods to give you, our customer, the best and longest lasting result. We would be happy to meet and discuss the ideas you have in creating your future Oasis. Please contact us to schedule your free estimate! Upper Deck Construction & Consulting is here to help you build your vision and create your reality. We offer various custom solutions in landscape construction. Prairie Outpost Garden Design INC.
We believe people are hardwired to both physically and emotionally respond to nature. Imagine if without even being aware of it you experienced a lower heart rate, decreased blood pressure and a general sense of calm just by looking out your window. Now imagine if you were to walk out your door and this feeling continues while you drive through your community. Imagine living in a City where every community inspired this same response. This is what we do….one house at a time About Our Clients: Typically our clients are homeowners who have renovated the interior of their homes or built new homes in older neighbourhoods. They are thrilled with their renovations but soon realize their landscape does not reflect the same style and quality. Instead they see tired, often boring yards which are uninspiring, unwelcoming and not functional. These are the Calgary homeowners who hire us to design unique, functional and wish list fulfilling landscapes. They want to be presented with options not only in design but also with materials. They want creative solutions to practical problems and they want the job done well. They also don’t want the project to drag on all summer. They want to see action in their yards. They want to watch it all come together and then marvel at how great it looks. These are our clients past and future. With over three generations of experience landscaping in Calgary, our commitment to individualized customer service has made us a leader in our industry, which is something we take great pride in. Mother Nature supplies the raw materials and the inspiration, but it will take talented professionals to design and landscape the yard that's about to become a high-end feature of your residential home. 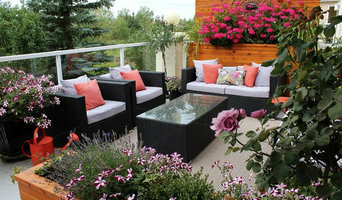 Aura Landscapers is a small, family-run Calgary landscape design & construction business started by James Knaut in 1981. We pride ourselves on communication, efficiency and outstanding customer service. We're available throughout your project to discuss our progress, make modifications and optimize the design plan as it comes together. Our process ensures your satisfaction, and then some. Take a look at our work and you'll understand why we feel we are uniquely qualified to design for people with discriminating tastes. Our work stands apart for its beauty and its attention to detail. From design to final installation, it’s an exercise in visionary aesthetics and high quality craftsmanship. It's no fluke we've made hundreds of Calgary and area customers happy their landscaping. We run a small, tight ship of professionals who you will get to know. Throughout the project, we talk to you. We talk to each other. It's no wonder yard lovers across town and beyond are talking about us. After 20 plus years, Natural Landscapes has become one of the most sought after Acreage, retreat, and residential landscape construction companies in Calgary and surrounding areas. For three generations, homeowners and businesses have trusted their Calgary landscape needs to Mirage Landscaping. Our commitment to unique design and high standards of customer service and craftsmanship is evident in our leadership and crew. The owner of Mirage Landscaping will bring his years of experience in the design and construction of landscapes in the Calgary community to your project. After working with you to create your own design, he will remain directly involved in all phases of construction, coordinating an expert crew to get your project done right. His experience in design ranges from simple, elegant Calgary landscapes to unique and intricate designs that include construction of paved stone walkways and patios with stone garden beds and retaining walls. 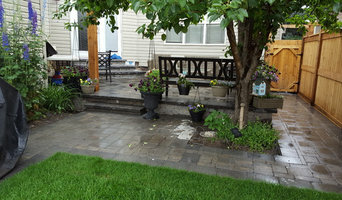 Beginning with your quote, through each stage of the construction process and until the last truck drives away, the owner of Mirage Landscaping will personally coordinate all aspects of your commercial or residential Calgary landscape, giving his personal attention to every detail, and offer you a 100% satisfaction guarantee. We are built around the philosophy of helping homeowners make their dreams come true. We pride ourselves on the customization of our services to fit the individual lifestyle goals of each client. Gardenscapes specializes in natural and sustainable landscapes and has been providing Calgary area homeowners with innovative landscape design and construction since 2000. Elise (Lisa) Van Ee, owner and operator of Gardenscapes Ltd., is a Journeyman Landscape Horticulturist with a strong agricultural background. Previous to receiving her apprenticeship certification through Olds College, Elise lived and worked on her family's mixed grain and dairy farm. Elise became interested in horticulture during her time employed in the golf course industry. Upon the inception of Gardenscapes Ltd., the company was a full service design/build operation, Elise and her partner Jorgen, worked hands on with the crew members in the creation of natural as well as traditional styled landscapes. Because of this hands on approach. Elise has been able to develop practical knowledge of a variety of materials which she now utilizes in her design development. Since 2012, Elise has enjoyed the privilege of collaborating with award winning design/build company, Year Round Landscaping, on many their projects. Gardenscapes strives to maintain focus on land stewardship and sustainability through the use of natural, local materials and conservation practices. Elise enjoys taking inspiration from the larger, natural landscape of the Calgary area, and adapting those elements to achieve well designed residential landscapes in a variety of styles. Alpine Construction and Design Ltd.
Alpine Construction and Design Ltd. is a landscaping company that designs, constructs and maintains commercial and residential landscapes throughout Calgary and the surrounding area. Always putting quality above all else, Jordan Reti has established a reputation as a specialist in landscape design and construction in Calgary, Alberta and area. His designer eye makes him a unique talent, creating landscape projects that are visually stunning with strong foundations that last the test of time. Infinity Gardens - Landscaping and Design is one of Calgary’s premier landscaping companies, with new modern ideas to create an outdoor living space that fits perfectly for you and your family. Since 1998 Rock Bottom Hard Landscaping has established the benchmark for quality, service and value among landscaping construction companies within the city of Calgary and surrounding area. We offer the entire spectrum of landscaping construction services to ensure that all of our customers acquire the landscape of their dreams as well as the value of their investment. Rock Bottom has steadily built a reputation as one of the top landscaping construction companies in the area by way of hard work and meticulous craftsmanship - rock bottom up! Offering Complete Landscape construction and the machinery to handle any job. Over the years many homeowners in and around Calgary have transformed their properties into stunning outdoor havens. Please visit our Portfolio to view for yourself the variety of landscaping projects we manage and the quality of workmanship. There's a special kind of pride that you will find with Rock Bottom, a pride that's meant to be stepped on! Owner Beau Reidel, Certified Landscape Designer, is the driving force behind the company's success, growth and longevity. The creativity Beau brings to his wide-ranging designs is proven by his satisfied customers. Rock Bottom Hard Landscaping's goal is always the same - A complete and stunning transformation of an outdoor space into an environment of timeless beauty and lasting satisfaction. Owner Beau Reidel works closely with each client to create a landscape design that fits their space, lifestyle and goals. He takes great pride in his work and over the past 18 years has built a reputation for excellence in landscape design and installation. Get to know Beau and his work through the website and please contact Rock Bottom Hard Landscaping for your next outdoor project. Ananda Landscapes is built around the philosophy of helping homeowners make their dreams come true. We pride ourselves on the customization of our services to fit the individual lifestyle goals of each of the homeowners we meet. Our process does not focus on the components of your custom landscaping, such as the type of deck or plants you might like. We instead focus on the opportunity we are going to create for you. We believe that your home is uniquely yours. That feeling grows with you and your home, and after several years of living there, the bond is difficult to break. It's where your kids grew up, where your friends gather, and where your life happens. With Ananda Landscapes, we encourage our clients to choose their own lifestyle. This starts with your home. Maybe we will create the opportunity for you to entertain close friends and family, or even the chance for you to throw extravagant parties for your entire network of colleagues and friends. Or, maybe we are creating the opportunity for you to have a sacred space to enjoy a glass of wine and reflect on the day’s events. Landscaping is more than simply deciding what will go where. 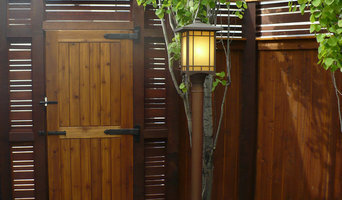 It's creating an outdoor space that inspires your desired lifestyle. When working with Ananda Landscapes we help you to define your desired lifestyle, make a list about the purpose behind your landscaping project and then imagine the possibilities. Contact us today to get started on how to plan your landscape & your outdoor lifestyle. Our promise is to supply the highest quality products and services to our customers. We always strive to go the extra mile in customer satisfaction, to give and create more than what is the norm. Twisted Rock Terrascape & Design, Inc.
With over 30 years of combined experience we can create your dream landscape with our unique design/build approach. We specialize in complete landscape construction. We have our own designer on staff and create all of our own landscape designs and drawings using the latest CAD software. We offer our clients a stress free approach to their landscape needs by organizing and communicating the entire process from design through completion. Our belief is that each customer is unique so we provide all of our clients with a personalized plan to fit their specific needs. Alpine Construction and Design Ltd. is a landscaping company that designs, constructs and maintains commercial and residential landscapes throughout Calgary and the surrounding area. Alpine specializes in customized landscape packages. Whether you have a large-scale commercial project or are landscaping your home Alpine will assist you with each stage of your project. From the initial consultation and design to the completion of your landscape, Alpine will be there to guide you through the process. Once your project is complete, Alpine offers an optional maintenance program to meet all of your maintenance needs. This will ensure your landscape continues to thrive for years to come.